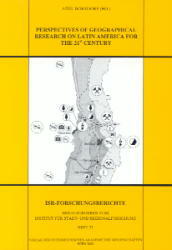 This volume of ISR-Forschungsberichte contains the quintessence of speeches of the two-day-conference at the Institut for Urban and Regional Research (ISR) of the Austrian Academy of Sciences on “Perspectives of Geographical Research on Latin America for the 21st Century”. This means an innovation in the conference scene on Latin American issues in Austria. Not contrac- ting on research results so much, but rather on gaps and new questions, it is orientated towards new perspectives of inverstigation allowing the ISR to take certain position within future key areas of research on Latin America.